An ingress controller is a piece of software that provides reverse proxy, configurable traffic routing, and TLS termination for Kubernetes services. Kubernetes ingress resources are used to configure the ingress rules and routes for individual Kubernetes services. Using an ingress controller and ingress rules, a single IP address can be used to route traffic to multiple services in a Kubernetes cluster. 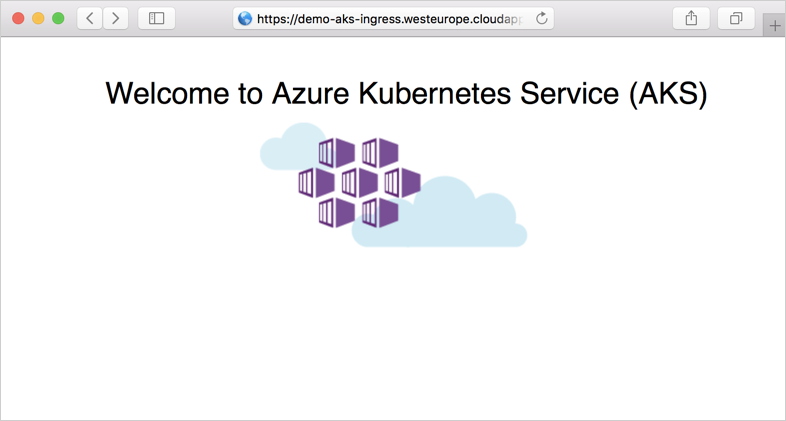 This article shows you how to deploy the NGINX ingress controller in an Azure Kubernetes Service (AKS) cluster. The ingress controller is configured with a static public IP address. The cert-manager project is used to automatically generate and configure Let's Encrypt certificates. Finally, two applications are run in the AKS cluster, each of which is accessible over a single IP address. This article uses Helm to install the NGINX ingress controller, cert-manager, and a sample web app. You need to have Helm initialized within your AKS cluster and using a service account for Tiller. Make sure that you are using the latest release of Helm. For upgrade instructions, see the Helm install docs. For more information on configuring and using Helm, see Install applications with Helm in Azure Kubernetes Service (AKS). This article also requires that you are running the Azure CLI version 2.0.61 or later. Run az --version to find the version. If you need to install or upgrade, see Install Azure CLI. By default, an NGINX ingress controller is created with a new public IP address assignment. This public IP address is only static for the life-span of the ingress controller, and is lost if the controller is deleted and re-created. A common configuration requirement is to provide the NGINX ingress controller an existing static public IP address. The static public IP address remains if the ingress controller is deleted. This approach allows you to use existing DNS records and network configurations in a consistent manner throughout the lifecycle of your applications. Now deploy the nginx-ingress chart with Helm. Add the --set controller.service.loadBalancerIP parameter, and specify your own public IP address created in the previous step. For added redundancy, two replicas of the NGINX ingress controllers are deployed with the --set controller.replicaCount parameter. To fully benefit from running replicas of the ingress controller, make sure there's more than one node in your AKS cluster. The following example creates a Kubernetes namespace for the ingress resources named ingress-basic. Specify a namespace for your own environment as needed. If your AKS cluster is not RBAC enabled, add --set rbac.create=false to the Helm commands. No ingress rules have been created yet, so the NGINX ingress controller's default 404 page is displayed if you browse to the public IP address. Ingress rules are configured in the following steps. The ingress controller is now accessible through the FQDN. The NGINX ingress controller supports TLS termination. There are several ways to retrieve and configure certificates for HTTPS. 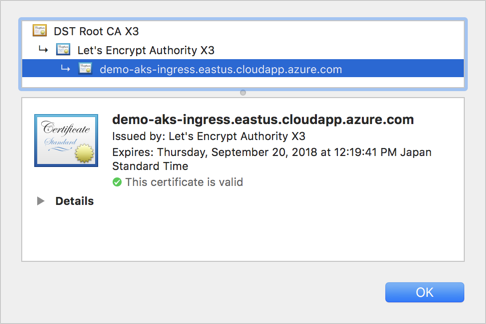 This article demonstrates using cert-manager, which provides automatic Lets Encrypt certificate generation and management functionality. This article uses the staging environment for Let's Encrypt. In production deployments, use letsencrypt-prod and https://acme-v02.api.letsencrypt.org/directory in the resource definitions and when installing the Helm chart. For more information on cert-manager configuration, see the cert-manager project. Before certificates can be issued, cert-manager requires an Issuer or ClusterIssuer resource. These Kubernetes resources are identical in functionality, however Issuer works in a single namespace, and ClusterIssuer works across all namespaces. For more information, see the cert-manager issuer documentation. To create the issuer, use the kubectl apply -f cluster-issuer.yaml command. An ingress controller and a certificate management solution have been configured. Now let's run two demo applications in your AKS cluster. In this example, Helm is used to deploy two instances of a simple 'Hello world' application. Both applications are now running on your Kubernetes cluster, however they're configured with a service of type ClusterIP. As such, the applications aren't accessible from the internet. To make them publicly available, create a Kubernetes ingress resource. The ingress resource configures the rules that route traffic to one of the two applications. In the following example, traffic to the address https://demo-aks-ingress.eastus.cloudapp.azure.com/ is routed to the service named aks-helloworld. Traffic to the address https://demo-aks-ingress.eastus.cloudapp.azure.com/hello-world-two is routed to the ingress-demo service. Update the hosts and host to the DNS name you created in a previous step. Create a file named hello-world-ingress.yaml and copy in the following example YAML. Create the ingress resource using the kubectl apply -f hello-world-ingress.yaml command. Next, a certificate resource must be created. The certificate resource defines the desired X.509 certificate. For more information, see cert-manager certificates. Cert-manager has likely automatically created a certificate object for you using ingress-shim, which is automatically deployed with cert-manager since v0.2.2. For more information, see the ingress-shim documentation. 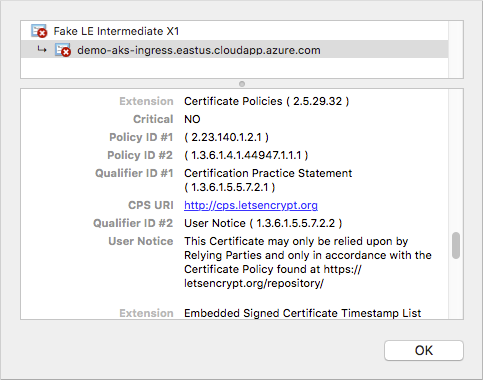 To verify that the certificate was created successfully, use the kubectl describe certificate tls-secret --namespace ingress-basic command. If you need to create an additional certificate resource, you can do so with the following example manifest. Update the dnsNames and domains to the DNS name you created in a previous step. If you use an internal-only ingress controller, specify the internal DNS name for your service. To create the certificate resource, use the kubectl apply -f certificates.yaml command. 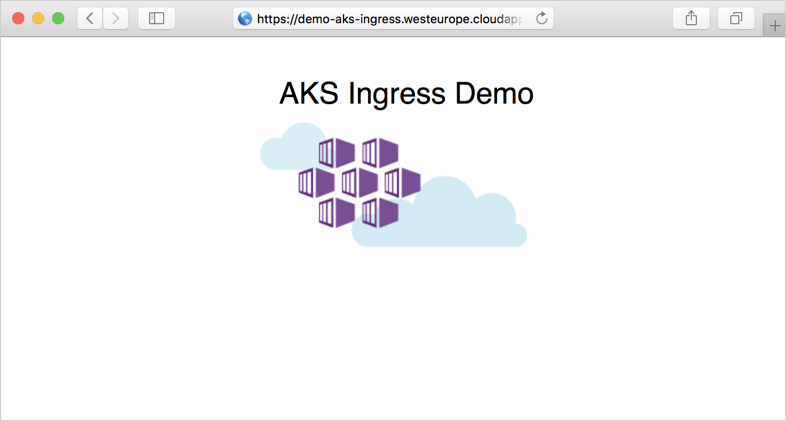 Open a web browser to the FQDN of your Kubernetes ingress controller, such as https://demo-aks-ingress.eastus.cloudapp.azure.com. This article used Helm to install the ingress components, certificates, and sample apps. When you deploy a Helm chart, a number of Kubernetes resources are created. These resources includes pods, deployments, and services. To clean up these resources, you can either delete the entire sample namespace, or the individual resources. To delete the entire sample namespace, use the kubectl delete command and specify your namespace name. All the resources in the namespace are deleted. Delete the releases with the helm delete command. The following example deletes the NGINX ingress deployment, certificate manager, and the two sample AKS hello world apps.